Thank you so much for stopping by...have a sweet day! Welcome to Stacey's Sweets! You can find us at the corner of Elm and 2nd Street on the Ozark Square (101 N. 2nd Street). *On Saturdays cupcake counter closes at 3. Custom cake pick ups may be scheduled until 4. We will never leave a cake locked inside. We have assorted cupcakes, cookies, cake pops, and other seasonal items in our bakery case, as well as cold bottled water and a huge assortment of vintage, glass bottles sodas. All custom cake and cupcake orders will need to be placed IN ADVANCE. PLEASE CHECK THE "CHECK AVAILABILITY" TAB TO SEE IF YOUR DESIRED DATE IS AVAILABLE. The best days to place an order by phone are Tuesday through Friday from 10:00 to 3:00. The shop number is 581-0525. Please do NOT text or Facebook any order information, as we could miss your message! If you order Saturday, Sunday or Monday you will be contacted the following Tuesday. Thank you! 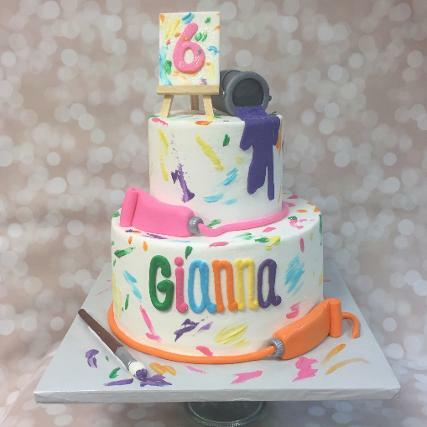 I love creating cakes for people...nothing is as exciting as seeing the happiness on a customer's face when they receive their one of a kind cake! Please remember that each one of my cakes is specially designed, baked, and decorated just for YOU. I promise you will get better taste, quality, and service than you will ever get at a grocery or discount store. Have a look around my Photo Galleries! Even if you don't see the exact cake you want, you'll get some ideas and see the quality of my work. Once you're ready to place an order (southwest Missouri only, please), contact me and we'll work together to create the cake you've always wanted!